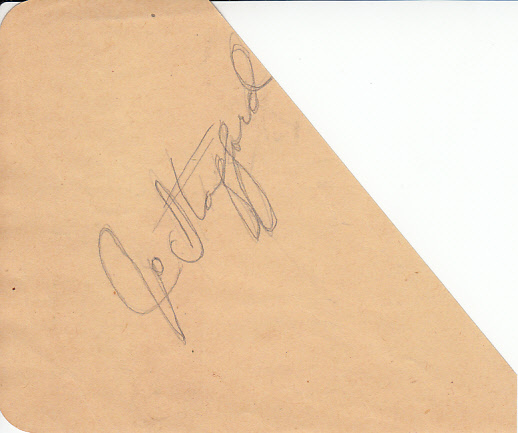 Roughly 4 1/2 by 5 inch autograph album or book page (top right corner trimmed off) autographed in pencil by singer Jo Stafford, who passed away in 2008. 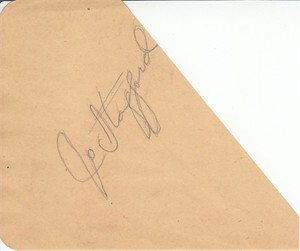 Stafford apparently wrote over her signature twice as the pencil didn't work properly the first time. Her 1952 song You Belong to Me topped the charts in the United States and United Kingdom, and made her the first woman to have a No. 1 hit on the UK Singles Chart. She was a 1961 Grammy Award winner for an album of comedic interpretations of popular songs produced with her second husband, Paul Weston. Obtained from the family of a Hollywood housekeeper who cleaned the houses of the rich and famous during the 1940s. Has typical yellowing for its age. With certificate of authenticity from AutographsForSale.com. ONLY ONE AVAILABLE FOR SALE.